According to reports, about 50 lakh-odd employees can go on a strike after the government’s decision to not increase the salaries of Central government employees beyond the recommendations made by the 7th Pay Commission. Earlier this month, the government delivered a big blow to the employees when it disclosed to the Rajya Sabha that it had no plans to revise their pay scale. “The minimum pay of Rs 18,000 [per month] and fitment factor of 2.57 are based on the specific recommendations of the 7th Central Pay Commission in the light of the relevant factors taken into account by it. Therefore, no change therein is at present under consideration,” said Minister of State Finance, P Radhakrishnan in a written reply. National Joint Council of Action (NJCA) chief Shiv Gopal Mishra, who led the pay hike negotiations on behalf of central government employees, reportedly expressed dissatisfaction over the government’s decision. “The employees are agitated and there is a lot of disappointment. I can assure that the demand to raise the minimum pay has not been forfeited. If negotiations do not give us a solution, then an agitation would,” he told Oneindia. 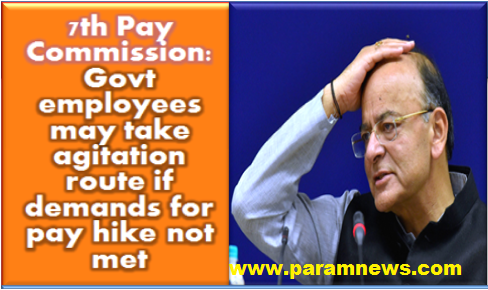 To remind you, ever since the 7th Pay Commission recommendations released, the central government employees have been demanding that the minimum pay be raised to Rs 26,000 instead of Rs 18,000 – based on a fitment factor of 3.68 times the basic pay of 6th pay commission – and the upper limit be raised to Rs 3.25 lakh a month. The unions had even threatened to go on an indefinite strike on July 11, 2016, but plans were cancelled after the government promised to look into the matter. Then came news reports that the government was considering hiking the minimum wages with a fitment formula of 3 times the previous basic pay. This would increase the minimum basic pay to Rs 21,000. The recent developments signalling zero change is, hence, a huge disappointment for this group. A pay hike over and above the pay commission’s recommendations seems unlikely when one considers the news of higher-than-projected revenue deficits coming in from various states. Earlier this month, Maharashtra’s State Finance Minister Sudhir Mungantiwar had said that the move to pay the sanctioned arrears would put a burden of Rs 21,500 crore on the state exchequer. A week later, a senior Tamil Nadu state government official estimated that the same would cause the state’s revenue deficit to spike by 15 per cent. Meanwhile, Tripura, where the Bhartiya Janta Party recently surged to power promising to implement the latest Pay Commission, is already facing a fiscal deficit of Rs 11,355 crore. All this is significant because state expenditures contribute significantly to the country’s consolidated fiscal deficit. Against this backdrop, the Modi government might find it difficult to top-up the recommendations of the 7th Pay Commission. Besides, earlier this month, the Cabinet approved a 2 per cent hike in the Dearness Allowance and Dearness Relief for central government employees, which together will put additional burden of Rs 6,077.72 crore on the exchequer every year. The financial pressure is projected to cross Rs 7,090 crore during the 14-month period between January 2018 and February 2019. With general elections coming up next year, the Centre would hardly want to risk placing additional demands on its coffers. Meanwhile, last week, Lok Sabha Speaker Sumitra Mahajan announced the formation of a committee to propose revision in the pay structure and allowances of Lok Sabha and Rajya Sabha secretariats employees, noting that the 7th pay commission did not make recommendations about their salaries. The six-member panel will include Finance Minister Arun Jaitley and Parliamentary Affairs Minister Anath Kumar, and will be headed by Murli Manohar Joshi, estimates committee chairperson.